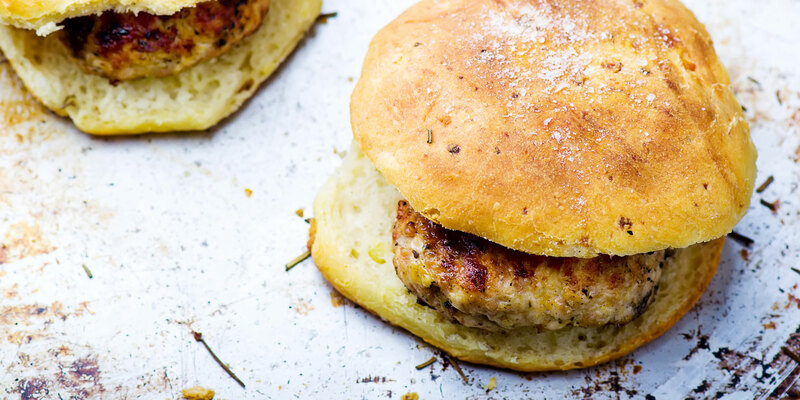 With or without buns, these moist and flavorful chicken burgers rock! In a large bowl, combine all of the ingredients except the bread crumbs for breading the burgers and the vegetable oil. Mix until well blended. If the mixture is too sticky or pasty, add 1 tablespoon water. Before you shape the burgers, you may want to make a test patty to check the seasoning: form about 1 tablespoon of the chicken mixture into a patty and cook in a little oil until well done. Taste, and adjust the seasoning in the rest of the mixture if needed. Divide the chicken mixture into 4 portions. Form each portion into a patty, then coat with the remaining ½ cup (25 g) of bread crumbs. Place the finished patties on a large plate and refrigerate, covered, for at least 30 minutes, and up to 6 hours. When ready to cook, heat the vegetable oil in a large nonstick skillet over medium-high heat. Add the burgers and cook for 6 minutes, or until the underside is golden. Flip the burgers and cook for 4 to 5 minutes, until they are completely cooked through. Remove from the skillet and serve hot. The ricotta cheese keeps the lean ground chicken from getting dry during cooking. For an incredible appetizer, make small, single-bite-size balls and serve them skewered with toothpicks, accompanied by the Fresh Mint, Cilantro, and Green Chile Chutney. Chicken sliders are also fun for social gatherings. Optional garnishes include salad greens, sliced fresh tomatoes, sliced raw onions, and assorted condiments. 261 Calories: Protein: 24 g; Carbohydrates: 11 g; Fat: 14 g; Fiber: 1 g; Sodium: 478 mg; Carb Choices: 1; Diabetic Exchange: 3 Medium-Fat Meat, 2 Vegetable, Calorie Cuts: Skip the buns and save 110 calories per serving.